Amazing performances and cultural events recorded live and screened at your library using top quality projection equipment. 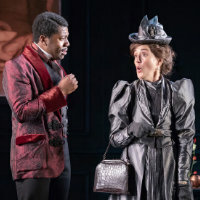 Oscar Wilde’s much-loved masterpiece throws love, logic and language into the air to make one of theatre’s most dazzling firework displays. Suffolk Libraries Presents brings quality theatre and exhibition events to Suffolk communities using the latest digital screening equipment. It’s funded by Arts Council England and runs in several of the county’s libraries with the aim of bringing more Suffolk residents into contact with the arts in a familiar and accessible local venue. Digitally recorded, internationally acclaimed performance and exhibition events will be screened using the latest projection equipment in Southwold, Stradbroke, Felixstowe, Ixworth, Gainsborough, Hadleigh, Lowestoft and Capel St Mary libraries. The performances will include the Globe Theatre’s productions of Julius Caesar and The Comedy of Errors ; well-known ballets such as Matthew Bourne’s productions of Sleeping Beauty and Swan Lake ; and unique, commentated tours of visual art exhibitions featuring artists such as Matisse, Rembrant and Van Gogh.